Vampire Council by Patrick Kampman. A road trip with a killer is not how Carmen wanted to travel to the opening ceremonies of the Convocation. But someone has been murdering her kind, and her traveling companion might be the only chance Carmen has to make it to the annual meeting of vampire society in one piece. Assuming he doesn’t simply take Carmen out himself. Only a week remains before the Convocation, where the vampires will gather to witness their mysterious Council, the strongest of their kind, make new laws and pass judgment on transgressors. Carmen has no choice but to attend. The only question is which threat is more deadly: those that pursue her, those that wait for her, or the one traveling beside her…. 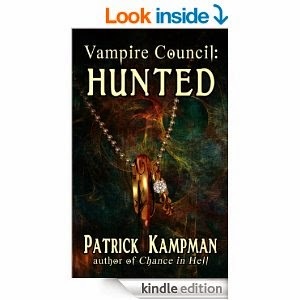 Patrick Kampman is an author that I'm well aware of after having read his excellent Chance Lee series but it'd been a while since he's released any new books, and so it came as a pleasant surprise to see that he'd just recently published a novel called Vampire Council. It goes without saying that it didn't take me long to buy the book. The book follows two main characters; Carmen, a beautiful spanish woman who finds herself on the run whilst dodging attempts on her life. She also happens to be a vampire. The other is Ryan, a vampire hunter, who has been asked by his closest friend and many ways his only friend, to protect a woman whose life is in danger. The woman of course just happens to be Carmen. And so as you can imagine a vampire hunter tasked with protecting a vampire, one who he happens to be instantly attracted to was alway going to be bumpy ride. And what a ride it was. The book was fantastic and had the right blend of humour, action, romance and mystery to make a cocktail that would get you intoxicated from just the fumes. The opening chapters had me laughing at the witty inner monologues going on between Carmen and Ryan as they first met. Definitely one of the most enjoyable beginnings I've read, that I could recall. The pace of the story was perfect, never lingering in any one spot for too long or rushing into another too abruptly. The action scenes were well written and had my eyes glued to the pages, riveted at what was going to happen next. However, where Patrick Kampman truly excelled at was the chemistry he created between Carmen and Ryan. Both were head strong and independent in their own ways and it was really enjoyable seeing how their perceptions changed over time, particularly Ryan who before meeting Carmen, believed all vampires were monsters and needed killing. I've always enjoyed romance being interlinked with a story, as long as it's done right, which was the case with Vampire Council. You can of course see it coming, from just reading the blurb it was pretty evident the main characters would head in that direction, but I was curious to read how that journey would unfold. The author didn't have them as soul-mates, destined to be together for all eternity within the first chapter, instead he slowly developed the couple into something believable. The writing as expected was crisp and flowed seamlessly. The dialogue was witty and the story kept me hooked. Although one minor problem I had was that I would've liked the author to have expanded more in the descriptive department. Nothing too major as I hate overly descriptive passages, but just maybe added few more sentences here or there when describing an introduced character/settings. I was 99% sure this was going to be an excellent book and my expectations were proven right. I finished the book more or less in one day and now I can't wait for the sequel. My anticipation only marred slightly at knowing how slow the author is in releasing new material. One last note, I've just realised I should have written a review of the Chance Lee series, but this review would basically be replicated - different story and characters but equally superb.